I've searched this forum for "standalone license" but I am not finding a link which takes me to the order page for that. Please don't advise me about the subscription version. I know all about it. Honestly,I don't care if it's so good it cures cancer and brings about world peace. I refuse to buy any subscription. End of discussion. I have a standalone license for version 6. All I want is to purchase a version 7 license for MacOS. Please tell me the URL where I can purchase that. And if possible, please make it easier for other people to find it too. I fully understand the push toward the subscription model, but as long as you do allow standalone purchases, there's no reason to completely hide the way to purchase it. Leave it out in the open and let the buyer decide. @JDW what you have to do is to download 1Password 7 from the AgileBits website (not from the App Store—because the App Store version supports only 1Password.com subscriptions). The package from the AgileBits website is exactly the same whether you're going to run the app as a standalone app or take out a subscription. Just be very careful when you run the installer to ignore all blandishments to take out a trial subscription and, towards the bottom of the large window seeking to persuade you to do that, look for the link that reads Need a license? We have those too. If you click on that link you should be able to purchase the requisite licence. If you do have any problems just post back here and one of us staunch supporters of the standalone version will help you. Will installing version 7 render my version 6 useless, so I can't roll back to version 6 if I so choose? 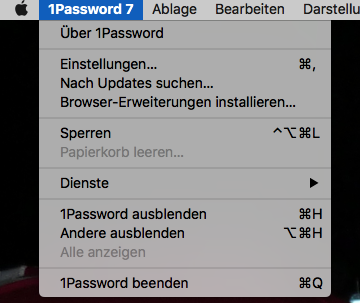 @JDW when you install 1Password 7 it creates in your Applications folder a zipped copy of your 1Password 6 installation so it's very easy to revert to 1Password 6 if you need to do so. There is more help, if you need it, in this AgileBits' post. After your payment is successful, you will receive an email showing a blue button. Click it to download the license. 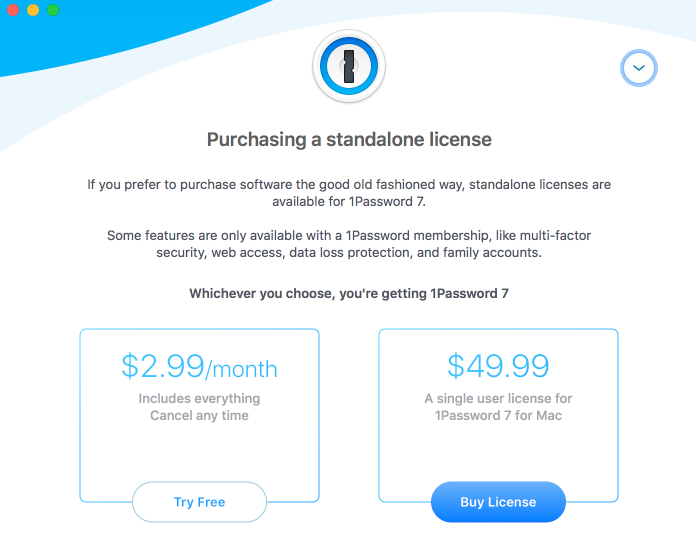 I was surprised because I only did that (download the license into my Downloads folder) and when I switched to 1Password 7 and clicked the "1Password 7" menu and chose "License..." it said "You are licensed!" So I guess 1Password is smart enough to detect you downloaded that license file to your computer. Not sure what happens if I delete that license file, but for now I'll just leave it in the Downloads folder. Again, I hope this helps those of you following in my footsteps. @JDW thanks for that excellent summary. I think you'll find that 1Password 7 has added its licence in the Software Licences category—in which case you can safely delete the copy in your Downloads folder. Still hoping for world peace and a cure for cancer, but thanks for reviewing the license purchase process — and for your support! Wow, this is terrible. This is, literally, the first time I've had anything bad to say about 1Password. And I've been a fan for YEARS. But this is the most offensive salesmanship I've ever seen, even on the internet. Bad agile. @ScooterNash . . . and you question for AgileBits support is? 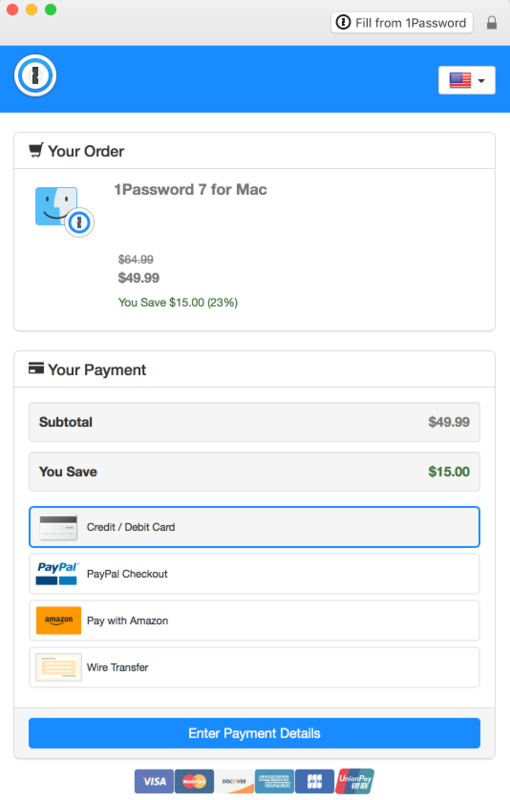 “Bad salesmanship“ or not, what I do know is that I love 1Password, and the step-by-step guide I presented in my earlier post allows anyone to purchase the standalone version. So long as people become to this forum searching for the standalone version can find my earlier post and follow it, they will be good to go. I personally dislike subscription models. I do not hide that fact. That’s why I don’t like modern Adobe software and advise people to by Affinity apps from Serif instead. But at least Agile can be praised for still offering a standalone version. Adobe cannot. And while I myself found it a tad troublesome to get the information I needed on how to buy the standalone version from Agile, the fact remains that I did the legwork, and anyone who finds my previous post in this thread can accomplish that task rather easily now. JDW, thanks for clearly documenting the procedure to buy a standalone license for 1Password. Indeed, not everyone wants to use 1Password the same way, so it's good that are different options, and an open forum where we can not only answer questions and point folks in the right direction ourselves, but also other helpful users can as well. Cheers! I too also strongly dislike subscription based pricing. I am a 1PW4/6 user and just purchased a 1PW7 stand alone license. Now I find out I need to buy it _again, for another $49 to use it on my Windows PC, versus my previous license which worked happily on both platforms. Paying full price for two licenses for a single user is ridiculous. Now, I'm stuck with half a working system, since my Mac can't talk to my Windows machine anymore and I have to either shell out for another separate license making this a very expensive update or change to subscription and waste the $50 for the license I already paid for. Debating exporting and dealing with the headache of migration to another system, with a more customer-friendly pricing structure, if this is the way of the future for 1PW. The ball is now in Santa Agile’s court. Will brotherly love and a giving heart to triumph? Or will Ebenezer Scrooge fill stockings with a measely lump of coal this Christmas? @JDW: To be clear, no one has to buy the same thing again: you can continue to use whatever version(s) you've already purchased. The charge is for the new version of 1Password, which is new work we've done, and I do think it's fair for us to get paid for our work just like everyone else. I sincerely hope that you're not compared to Ebenezer Scrooge any time you ask to be paid for your work. @1PWDR: Can you elaborate? It sounds like you just have a sync configuration issue. If you'll let me know the OS and 1Password versions involved and the sync method you're using, I'll be happy to help you get sorted. I in the past when I paid $50 for the standalone version of 1Password, I got both the Mac and Windows versions. But now if I want to buy the standalone version, I must choose one or the other -- we no longer get both. Hence my post about Santa and Scrooge. He is not saying he doesn't want to pay. He is saying he wants to pay to get the new version, but he is distraught he can no longer get both Mac and Windows versions with that single license payment. Simply put if Agile could offer both the Mac and Windows versions in the past for a single standalone purchase fee, it is only logical that it wouldn't cause undue harm to Agile to offer that same deal to veteran customers today. @JDW: Sorry. I prefer not to argue about inaccuracies like that if I can avoid it, because it doesn't get us anywhere...but I guess I can't avoid it in the case. Not to put too fine a point on it, but the idea that one has to choose between the Mac and Windows versions just isn't true: anyone can buy both if they want, and many people do. You're right though, that's what was said. But the fact is that a single license has been 65$US for nearly 3 years. Prior to that, a license for one of them was 50$US. Certainly some people purchased 1Password when it was on sale though. I don't, however, think it's fair to make disparaging remarks like that just because we're not running that type of sale constantly, in perpetuity. And before that, we did used to sell "bundles" for both the Mac and Windows versions -- not for 50$ though, except, again, on sale maybe. We stopped offering that option long ago because people -- perhaps understandably -- thought that would allow them to use 1Password across all of their devices, when that wasn't possible (Google Play and the App Store are, of course, not conducive to such a thing). So it caused more confusion and frustration than anything else. And since there is actually a way to get what more people expect -- all of the apps together, in the form of a 1Password membership -- we have no plans to go back and try something that never worked well in the first place again. I realize that may not matter to you, but it's something we have to consider for all 1Password customers. Certainly us doing the thing we know has a negative impact on literally thousands of people could satisfy a few, but I don't think that's a reasonable tradeoff to make -- especially considering we know better now. It's been less than 5 months since my purchase of 7.1.2 as a standalone version, and in the past when I purchased standalone versions there were minor updates downloadable for free until the next major update, so I assumed such would be the case with my standalone purchase of version 7. And when I purchased at the end of July 2018, the version I received was 7.0.7. 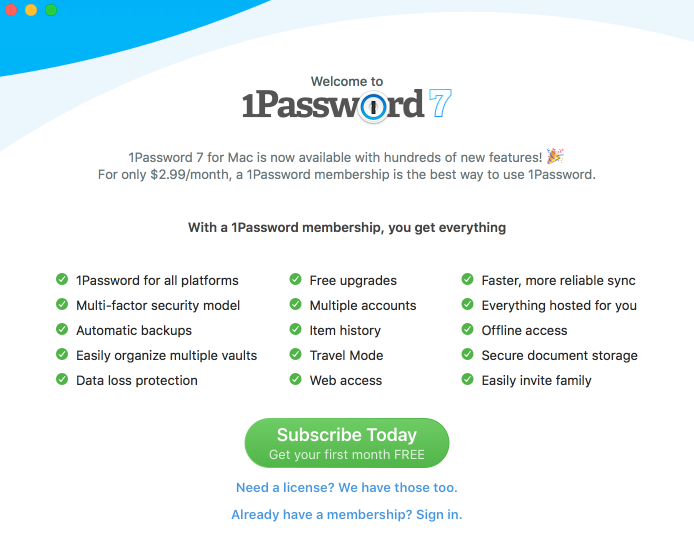 And just to be clear, a license for !1Password Mac version 7 entitles you to all minor updates, so there's no cost in updating to 7.2.2, etc. Cheers! Thank you very much for your kindness in explaining that, brenty! I successfully installed and am now running version 7.2.2. I'll keep my eye on this after a future update comes out, and if the same problem occurs, I will post a comment here. All good for now though! I spoke too soon. I'm now in a world of hurt. 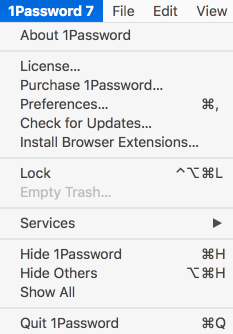 The 1Password browser extension no longer works on Safari or Chrome or FireFox (all latest versions) on my High Sierra (latest version) 5k iMac. Clicking the little icon beside the address bar in any of those browsers merely switches to the 1Password app (if open) and then immediately switches back to the browser -- that's it. (If the 1Password app isn't open, the browser window merely flashes.) Clicking on the little icon in my menubar with a browser open tells me I need to install the browser extension, even though it's already installed. I've deleted and reinstalled the extension and relaunched all of those browsers to no avail. I've even tried launching the 1Password 7.2.2 app and used "Install Browser Extensions" and installed from the web page that appears in the browser, but to no avail! I've also tried installing the extension from the Safari extensions Gallery, but that adds a different lock icon to my browser, and I end up with 4.7.3 and 7.2.2 extensions, neither of which work. Even when I uninstall 4.7.3 from Safari, the remaining icon still doesn't work. And when I tried to uninstall that I'm told I cannot because it's a part of the 1Password app! So something seriously changed in 7.2.2 to cause this to happen. I now regret updating to 7.2.2. I guess 1Password was not installing the update to 7.2.2 because it somehow knew this problem would occur! Any advice on how to resolve this serious problem would be appreciated. Thank you. @JDW: Doh! I'm sorry that you've hit another snag here. Thanks for letting me know. If you’re reading this and you are not JDW, this Support ID is for JDW only. Please ask us for your own if you also need help. This will link it to our current conversation. Once we see it we should be able to better assist you. Thanks in advance! P.S: Just to clarify, Apple is killing off the old extensions very soon, so 1Password for Mac version 7.2 and higher uses a new Safari App Extension. That's why you're seeing the difference there now. Oh, thank you, Brenty! Restarting fixed the problem. Whew! Awesome! I thought it might, but wasn't 100% certain and didn't want to set your expectations too high. The Safari change is a fairly big one, so I'm not surprised that was necessary. But it should be much smoother with future updates, with that out of the way now. Cheers! Hi guys, this is an awesome thread. I just wanted to install the stand-alone license on my mother-in-law’s iMac. I had done the same on mine years ago. However, I believe I did something wrong. I have now a 30-day trial license and I don‘t find the option „purchase license“. Attached is a screenshot. Unfortunately, only in German. Can you tell me what to do? I just recognized the the exactly the two items „license“ and „Purchase 1Password...“ are missing. Everything else seems to be identical.